Black Painted Jeans In Slim Fit. Top half of these painted jeans by MNML are treated with a black coating over medium-blue denim. 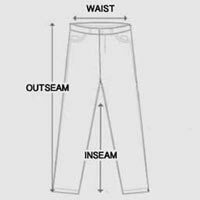 Slim fit jeans designed with a mid-rise waist and slightly cropped length. Five-pocket design finished with belt loops and button fly. Coated jeans detailed with red threaded accent and distressed markings. For the freshest denim, try these painted jeans maxed out with industrial details.